Because biomass can be used not only to generate electricity, but also as a source of heat and motor fuel, it makes up the largest chunk of renewable energy in most countries by far. Craig Morris says, however, that the growth of biomass is largely over in Germany. At the beginning of 2013, Berlin-based think tank Agora Energiewende published its 12 insights on Germany’s Energiewende (PDF), an overview of the main points. The first one reads, “It’s all about wind and solar.” What about biomass? 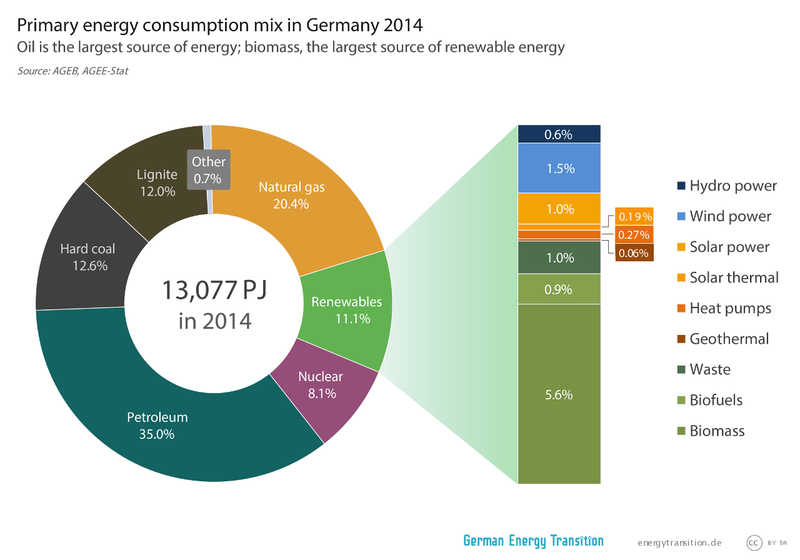 Renewable energy made up only 11 percent of German primary energy consumption in 2014. More than half of it was biomass. Last August, the revisions to the Renewable Energy Act put a limit on funding for new biomass systems – no more than 100 MW would be supported. To put this into perspective, the market had more than 5,000 MW of biomass-fired power generation capacity installed (cumulative) at the end of 2013. In February, the German Energy Ministry published a presentation (PDF in German) showing that it understands that the already low target of 100 MW will not even be met this year – slide 11 says “probably less than 30 MW” of biomass will be installed in 2015. In a longer study (PDF in German), the Ministry puts a finer point on the issue. In two tables (1 and 2), the Ministry breaks up the biomass sector into various types of bioenergy and technology options. One of the columns concerns the “growth potential,” and the column contains only two labels: “low” and “0.” In other words, from here on out, there will be little growth from biomass within the power sector. Further growth will come almost exclusively from wind and solar. Up to now, the EU has been the main driver behind bioenergy to replace diesel and gasoline. But in October, the German government will implement a greenhouse gas quota instead of a minimum blend requirement for biofuels. The focus is on reducing carbon emissions, but the German biofuels sector itself understands the change to be a challenge to its own market. In other words, biofuels for mobility probably do not have a bright future in Germany. otherwise focuses on waste products. Indeed, Germany is so successful in its focus on reusing waste as a source of energy that there is already practically no further potential left. A study published this month on waste recovery (PDF in German) revealed that around 60 percent of trash in the US ends up in landfills, thereby going completely unused (other than polluting the local environment). As a previous study showed (PDF in German), that figure was less than one percent in Germany – way back in 2006. So Germany has been reusing its waste, partly for energy production, for the past decade. The bad news for the biomass sector is that Germany does not look like a lucrative market for the time being. The good news for those worried about the Energiewende’s sustainability is that Germany started thinking about environmental impacts a long time ago. In short: the utility Vattenfall has planted 600 hektars (1 hektar = ca. 2.4 acres) with fast growing poplar saplings, increasing the German biomass fields by about nearly 10%. Parts of the new poplar plantations are situated in Poland where there are huge open mines as well to be re-cultivated. The former lignite field and holes offer huge potential for these plantations. This land is of little and no use for farming, the ruined soil structure would make it difficult to grow even a halfway natural forest there. Wind and fire would be a permanent risk. In short: logging forrests or using good agricultural land for growing combustion biomass is not good for the climate. Using waste land should be prefered. As far as I know all imported timber power plants in the UK are laying idle anyhow, can’t compete – is this correct? All waste incineration, whether for energy production or merely to reduce the amount of waste in land-fills, produces dioxins that are the most potent form of carcinogen produced by people. Even minute amounts falling out of the atmosphere onto farmland and houses can cause health problems. I refer readers to the work done in the USA to ban waste incineration, particularly the work of Professor Paul Connett; he has been consulted by around forty countries on how to deal with toxic wastes. The burning of plastics derived from petrochemicals is particularly problematic. Burning waste is indeed tricky for the health of people. It would be healthier for the population, not to burn that waste at all, but to concentrate it at a controlled storage site. It would be healthier for the population, not to burn that waste but to concentrate it at a controlled storage site. Previous PostIs Germany reliant on foreign nuclear power?